Say good-bye to Cai Guo-Qiang’s “Inopportune: Stage One” neon car crash—the commentary on 9/11 and terrorism that has greeted visitors to the Seattle Art Museum lobby since 2007—and hello to Seattle artist John Grade’s 105-foot-long “Middle Fork,” which will be suspended from the entire length of SAM’s lobby ceiling on January 17 and officially open on February 3. 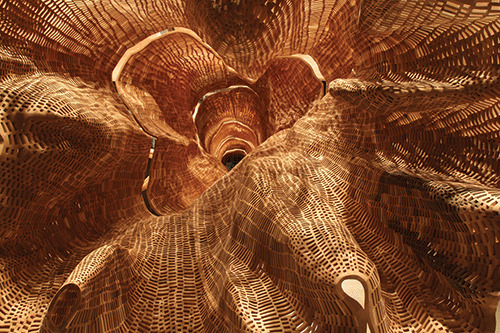 In 2014, Grade (pronounced “GRAH-day”) spent two weeks 85 feet off the ground in a 140-year-old western hemlock near North Bend, creating casts of its bark to make “Middle Fork” for the 2015 reopening of the Smithsonian Museum of American Art’s 140-year-old Renwick Gallery. The sculpture, comprising half a million bits of cedar, will eventually wind up back in North Bend, where Grade will let it rot into the mossy forest floor at the foot of the tree from which it was modeled. But not right away.